This pattern is available for free on my blog - www.loopsandlovecrochet.com. 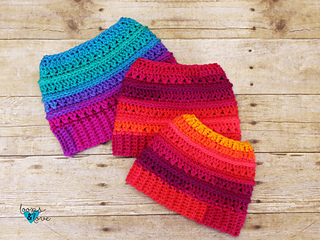 Here you are paying to purchase an ad-free version of this crochet pattern. if you’re also interested in my other criss cross stitch crochet patterns, you can purchase the PDF files for all of them together in my Criss Cross Stitch Bundle. 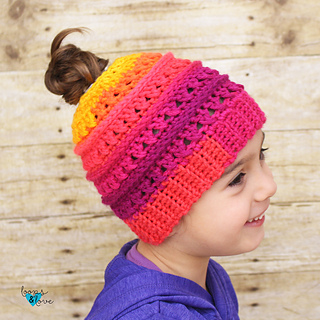 The PDF pattern includes written instructions with a photo tutorial of the stitches/instructions to help you along the way, if needed. This pattern is intermediate-beginner friendly, but it is also a fun pattern for more experienced crocheters. Note - I also have a non-messy bun version of this pattern. See the listing for my Criss Cross Beanie. Worsted weight yarn – You can use any worsted-weight yarn for this project. I used Red Heart Super Saver Stripes to get the rainbow effect, but this hat also looks great in solid colors or whatever colors combination you choose. 5.5 mm crochet hook (You may have to go up or down a hook size depending on the yarn brand you choose as well as your tension when you crochet. More info in the pattern). 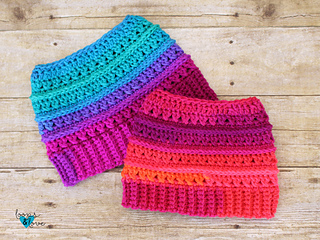 You may make and sell any items made from this pattern, but please link back to this pattern or Loops & Love Crochet. Please do not share, reproduce or copy this pattern for any purpose. Please do not re-publish photos as your own. Thank you for respecting my rights as the designer and for supporting Loops & Love Crochet.